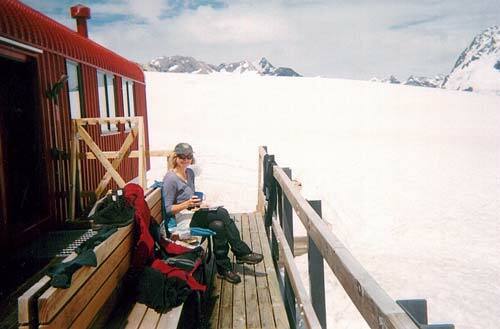 Warden Michele Ayres enjoys the sun on the deck at Mueller Hut in Aoraki/Mt Cook National Park. But one evening an unusual visitor disturbed the calm. Contributed by Michele Ayres of Christchurch. On most days in the summer season the Sealy range is a great place to explore. To discover Mt Cook lilies in the late snow is a bonus. To ascend Hilary’s first summit, Mt Ollivier, is entirely feasible. On any day Mueller Hut is a great place to stay, but some days prove more interesting than others. On this day our jokes and laughter ricochet round the empty hut – welcome space left by scurrying climbers descending 1,100 metres to Mt Cook village through sleet. So at 4 p.m., surrounded by swirling mist and thick rain, I contemplate an early nosh of bacon and eggs, a serious read, and reduced warden duties. As I glance outside, a shadow flits past. We stare. There is a thunderous bang at the rear bunkroom. Air blasts through our cosiness, accompanied by a strident figure splaying droplets and shouting ‘Crikey!’ A thin plastered shirt, cotton trousers, sandals and a plastic bag of biscuits circle pooling water on wooden boards. No answer, maybe he didn’t hear, hmm. His pupils flicker − irritated, staring straight through me. Steve rushes off to the wardens’ quarters, muttering ‘… hot tea – hypothermia …’. Warning prickles ¬shoot up my back − please don’t leave me alone with him. This, whoever this is, is not suffering from hypothermia. This – he doesn’t want us here … didn’t expect to find wardens at Mueller. Ha ha, too much scary film talk, now see where it’s got you. I persevere, but he sits behind me, munching rapidly, incisors working crumbs. Cold malevolence seeps along my back: hurry up, Steve. On cue he returns with a steaming mug. No reply … stare, stare. I watch this surreal play − maybe he doesn’t like females. But no, Steve gets the same treatment. Intrigued, I wait for Steve’s next move. He remains standing, concerned, eventually meeting my eyes. I try to convey my discomfort, purse my lips and shake my head: yes, now you’ve got it. Wordlessly we assess this figure who wants no part of a homely hut world. He rises, shooting crumbs, spraying drops and ignoring tea. Heaves his shoulders and stomps through the back to a slick, darkening mountainside and a destination unrealised. Our pleas are ignored. How do you help someone who refuses? What to do…? We radio base, alert them to a lone figure descending in severe conditions poorly dressed − what more to do? There are no subsequent reports, no sightings. A strange one indeed.